The Stonecast Concrete Basin offers a stylish alternative to standard white porcelain basins. They are well suited for Beach cottages, Game Lodges , Holiday Resorts and contemporary designed family homes. Our large production range offers many shapes and sizes that cater for all needs. The majority are counter top designs but some shapes do allow for ‘under-mounting’ or ‘drop-in’. We also able to custom manufacture new shapes to client specification, if required. Extra Large kitchen basins or large custom integrated basins are usually manufactured in fibreglass with a cut -sandstone finish in suitable colours to reduce weight and facilitate delivery and installation. Our unique concrete Basin recipe was perfected in 2005 . The mix of high alumina cements and aggregates allows the stone basins to withstand hot water without cracking. 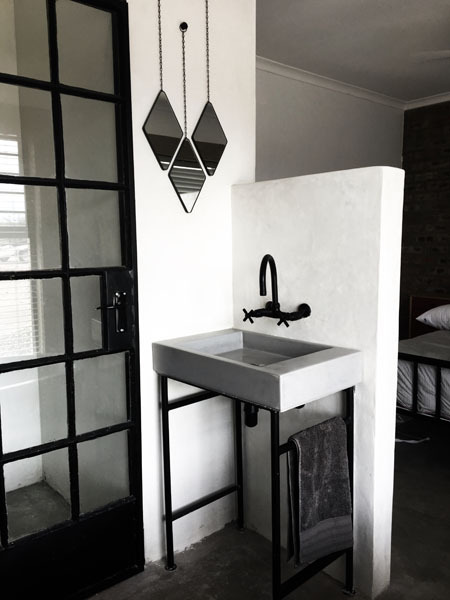 The natural quality of the raw materials is accentuated in the finishing and the outside surface of the basins can be left raw for a more natural or rustic feel if desired. Stonecast basins are all sealed with an industrial strength sealer that facilitates hygiene and prevents staining. A Standard, Unslotted, Extra Length Clicker Plug is recommended for all our concrete basins as there is no overflow hole or chain attachment for a loose plug fitting. 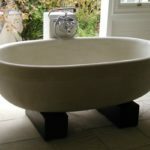 Due to the weight of the concrete basins, it is advisable that they are placed on top of a suitable strong vanity surface such as wood, stone or concrete . Unfortunately we do not have a colour chart or supply colour samples as it is very difficult to match colours . This is due to the nature of the casting process and the cementitious raw materials used.